Around 7.30pm when the last of the winners for the top six had been announced, there was something distinctively different with this conference of the ANC. The thunderous celebrations that are characteristic of similar moments in the last two ANC conferences were missing. The Nasrec hall was muted even. This was because there was no outright winner. Although Cyril Ramaphosa had calmed the nerves of many South Africans as well as the markets by winning the hotly contested presidency, the rest of his top six was a great surprise. One of the big surprises was Senzo Mchunu, who was also supported by Ramaphosa, losing out to Free State premier Ace Magashule for the position of secretary-general. Mchunu looked disbelieving after he started walking towards the podium in anticipation of a victory, but it was Magashule who stole the show. Mchunu was apparently the victim of some pact between Mabuza, Magashule and Zweli Mkhize, who had been discussing unity over months. Mkhize, Mabuza as well as Gauteng chairperson Paul Mashatile had tried in vain to stop Ramaphosa and Dlamini-Zuma from contesting against each other. Through the chairpersons forum, they worked to support each other and Magashule, who has been criticised for being too close to the notorious Gupta family, was a beneficiary of that. The pact also played a role in the elevation of Mabuza to the deputy president position. But Sisulu lost out because of the on and off relationship with Ramaphosa. Initially Ramaphosa’s deputy was believed to be Zweli Mkhize. But after a blistering start to her campaign in which she owned up to ANC mistakes and criticised the party’s hierarchy, Sisulu assumed that position. But Sisulu was not content with being a pliable deputy. She continually questioned why Ramaphosa could not deputise her. This led to Ramaphosa publicly announcing that science and technology minister Naledi Pandor would be his deputy. But the branches which supported him chose to stick with Sisulu. This confusion ultimately cost Sisulu because Mabuza meanwhile stood firm as Dlamini-Zuma’s preferred deputy throughout. Her loss meant that the top six officials were left with only one woman, Jessie Duarte, marking a regression on gender issues. The previous top six included two women. Jessie Duarte and Baleka Mbete. But the biggest single factor that swung who landed in the top six was that three ANC chairpersons, Magashule, Mabuza and Mashatile, had been provincial chairpersons for too long and wanted to move to the national stage. Instead of working in silos to pursue individual ambitions, they worked together on a joint strategy which mainly consisted of getting their branches to back the three of them. Zweli Mkhize was expected to be their “unity” candidate for president, but he never gained traction. The three chairpersons were also supported by North West chairperson Supra Mahumapelo, who also threw his provincial weight behind them. The chairpersons structure, also informally known as the Premier League, was the ultimate victor, saddling Ramaphosa with fellow leaders he would not have preferred. The biggest loser was the struggle to elevate women to the top. The ANC in KwaZulu-Natal, which has the biggest membership of all nine provinces, failed to get anyone in the top six, the first time this has happened in years. Cyril Ramaphosa’s election as ANC president has been welcomed by opposition parties represented in Parliament and they are calling on him to spearhead President Jacob Zuma’s recall from office. 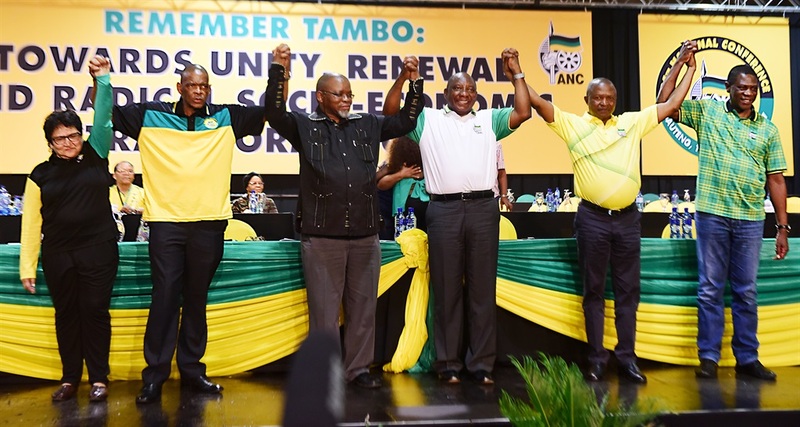 Nominations for the ANC’s yet to be announced 80-member national executive committee (NEC) are a mixed bag of deeply controversial individuals as well as leaders who have been casualties of President Jacob Zuma.